The Class of 2016 will receive 795 diplomas during Indiana University East’s 45th Commencement Ceremony at 6 p.m. today (May 13) at the Richmond High School Tiernan Center. Of the degrees being conferred, 772 are bachelor’s degrees and 23 are master’s degrees. This marks the most degrees awarded to one graduating class in IU East’s history. Indiana University-Purdue University Indianapolis Chancellor Charles R. Bantz has announced Nasser Paydar, chancellor of Indiana University East and professor of mechanical engineering, as IUPUI’s next executive vice chancellor effective June 15, pending approval by the Trustees of Indiana University. Paydar was selected for the post after an extensive national search, chaired by William Blomquist, dean of the School of Liberal Arts at IUPUI and professor of political science. 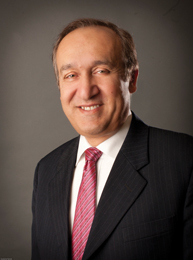 Paydar succeeds Uday Sukhatme, who is leaving to become the provost at Pace University. Indiana University East is being recognized both within Indiana and nationally for creating a new model for higher education that is productive, efficient and of high quality. IU East’s, growth – a 65-percent enrollment increase over the past four years – innovation, and community college collaboration have garnered national attention. Indiana University East will undergo a comprehensive evaluation visit in October 2011 by a team representing the Higher Learning Commission of the North Central Association of Colleges and Schools. IU East has been accredited by the Commission since 1971, and was last evaluated in 2002. RICHMOND, Ind. – Seven Indiana University East students studied abroad throughout Europe as part of a broad-based culture and non-linear music history and composition courses. The students visited two main city epicenters of music – Venice and Vienna – while they traveled. Students left for Europe on May 24 and returned June 7. Indiana University East employees have done something unprecedented. Ninety-five percent of faculty and staff made a contribution during the 2009 Campus Campaign, setting a new participation percentage record for the annual faculty/staff fund drive.